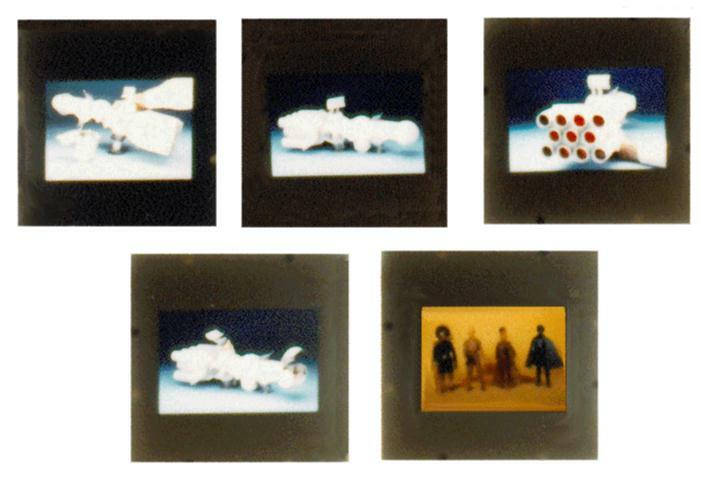 These slides show various views of the Blockade Runner prototype toy. The first slide on the left shows the detached escape pod. The next slide shows the side view of the toy, the next one shows the rear engines that are red and light up. The final slide shows the ship with the cockpit open. One other slide shown here is worth mentioning. Although you cannot see it here, the Lando doll prototype on the right side of the slide has the painted Hardy Boys doll head. This head was briefly mentioned in Steve Sansweet's book Star Wars: From Concept to Screen to Collectible. A real Lando head was later sculpted for the doll, but the one shown here would make anyone crack up when you tell them what it actually is. The other three prototype dolls shown can be seen on the boxes for each.